This offers you UV protection while also prevents your makeup from wearing off! 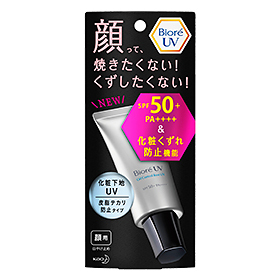 - SPF 50+ effectively protects skin from UVB rays that cause sunburn, dark spots and freckles. - PA ++++ effectively protects skin from UVA rays that cause suntan and reduce skin's elasticity. - Makeup base conceals pores and absorbs excess sebum for longer-lasting makeup. - Sweat resistant formula keeps makeup looking fresh for longer. - Oil Control Formula with a sheer toned gel for shine-free coverage with a soft matte finish. - Light gel texture spreads easily for instant absorption with no sticky after-feel. 1) Sample Redemption is open to all residing in Singapore only. 2) Each household is permitted to request 1 set of sample only once. 3) Entries with incomplete entries will be deemed invalid. 5) Please allow 3-4 weeks for your samples to be mailed to you. 6) By participating in this program, you agree to be contacted by Kao Singapore Pte Ltd for future marketing related activities.